Stopping by Macy’s for some holiday shopping this year? You might be able to pick up an Apple Watch or a brand-new iPhone 7. Following the launch of new Apple products on Wednesday, Macy’s has announced plans to sell Apple gear at 180 of its retail locations across the country. The iPhone, Apple Watch, MacBook, and other Apple accessories are expected to be available at Macy’s just in time for Thanksgiving and the holiday shopping season this year. Macy’s president Jeff Gennette made the announcement during a call with analysts on Thursday, according to Fortune. “It will be in all of our top buildings for the holiday season,” said Gennette, who will become Macy’s CEO in early 2017. On Wednesday, Apple unveiled the iPhone 7 and 7 Plus line, a new Apple Watch Series 2, and a special Nike-branded Watch edition. These products, along with the original Apple Watch Series 1, are expected to be sold at Macy’s. During the call, Gennette also said that this retail partnership with Apple will also include opening up Apple pop-up shops within larger Macy’s stores. The first of such Apple stores will open up inside Macy’s 1 million square-foot flagship at Herald Square in New York City. This partnerships makes Macy’s the first department store to house an Apple store. Previously, Apple products like the iPhone and the Apple Watch had been available at other big retailers like Target and Best Buy. The Apple Watch, in particular, is a hot seller at Best Buy. 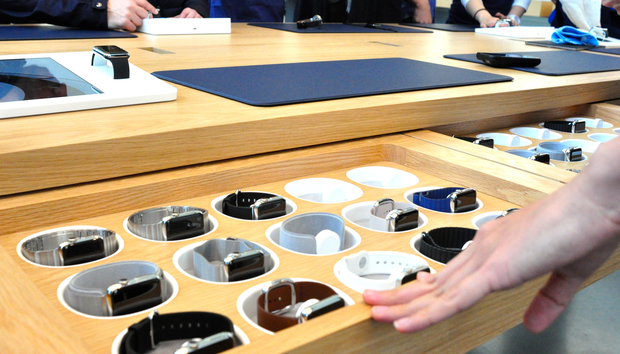 Last year, the electronics store started selling the Watch in only 100 locations. Demand was so high, however, that Best Buy immediately expanded to selling it in 1,050 stores well before the holidays. The story behind the story: According to Fortune, this Apple partnership is in line with Macy’s new strategy to bring other brands inside its confines. Previously, Macy’s has hosted pop-ups from Best Buy and the Sunglass Hut. Macy’s is trying to use Apple’s highly popular products to lure customers inside its mega-stores as it continues to struggle. Sales have fallen for six straight quarters. This year, the company has shut down 40 stores and announced that it will be shutting down 100 more in 2017, leaving only 650 locations.